The Presto 3.0 features Gerber’s patented F.A.S.T. assisted opening technology for quick, easy, one-handed deployment. The dual-position safety protects user while the blade is in open and closed positions. The Presto has an aluminum handle with SoftGrip overmold for excellent grip in adverse conditions. 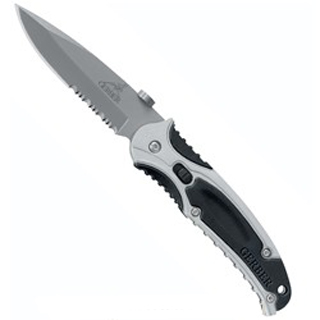 The drop point style blade is 440A stainless steel with abead blast finish and partially serrated edge. The thumb tab make for easy opening and a slide of the button releases the blade. Includes tip-down pocket clip.